My name is Gemma and I am the Owner of White Peony Cake Company. I am a fully qualified patisserie chef, and have been creating cakes for all occasions for the past 8 years. I started working as an assistant in a popular cake shop based in Newquay, which then lead me onto completing my chef and patisserie qualifications at St Austell College. During my patisserie career, I have spent time working for Rick Stein, as well as undergoing courses and training with the likes of 'Peboryon' and 'Couture Wedding Cakes by Sweetcheeks Ltd'. 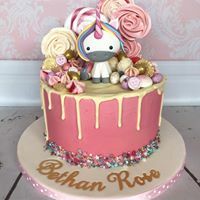 I absolutely LOVE designing, baking & decorating cakes and I particularly enjoy taking a customer's ideas and creating it into something which is both incredible to look at and eat! Everything I make is made to perfection in my little kitchen in Cornwall! based in Newquay I deliver locally and all prices quoted include delivery. Can't see exactly what you're looking for please email ask@mumsbakecakes.co.uk quoting White Peony cake co. and I'm sure we can create something special together.